On the verge of his second successive Seve Trophy success - his Great Britain and Ireland side holds an all but impregnabale five-point lead entering today’s 10 closing singles - his ascension appears inevitable. Surely nothing can deny him now. The 44-year old Dubliner has played a blinder in every sense of the word in Paris. He has combined perfect tactics with some shrewd observations, starting with his claim that his team boasting the world No 2 (Lee Westwood), the Open champion (Darren Clarke), a player who had just won twice (Simon Dyson) and a two-time world Match Play champion (Ian Poulter) was somehow the underdog. Genius. True, he hasn’t won many tournaments in his career (four on the European Tour) but he light-heartedly reminded us several times of his pedigree as a team man with a host of Ryder Cup, Seve Trophy and Royal Trophy wins to his name. “If only I had had as successful an individual career,” he said several times. This was a clever piece of rebranding by McGinley, aggrandizing his team record by belittling his relative failures as an individual golfer. 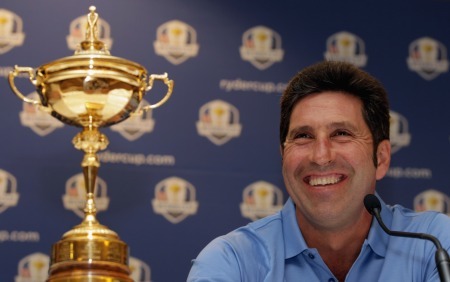 The Ryder Cup captaincy game - jobs for the boys in the eyes of the cynics - has become a very serious business for both the European Tour and the players themselves. Those who don’t fancy the Irishman for the job will point out, no doubt, that he hasn’t won a major and is far inferior, say, to the likes to Thomas Bjorn or Darren Clarke, who will also be considered for the job at some stage. When? That will depend. If the 2014 captaincy was to be awarded today, McGinley would get the vote of the vast majority of the committee. He is popular, respected and, above all, able. Having friends such as Jose Maria Olazabal, Colin Montgomerie and Padraig Harrington on his side will not hinder him either. Politically astute, McGinley cleverly dodged a bullet by fleeing the Nick Faldo camp three years ago, resigning his assistant captaincy with the excuse that he wanted to concentrate on making the team. 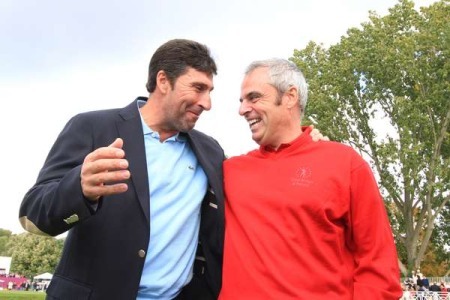 Whether he is offered (or accepts) a vice-captaincy role under Olazabal at Medinah remains to be seen. Beyond keeping his nose clean and finding some form on tour, there is precious little he can do over the next year or so to enhance his candidacy credentials. As a proven winner, all he has to do is avoid any big defeats on or off the golf course. But if a week is a long time in politics, 15 months is an eternity in golf. McGinley, for all that, appears to have endless credit. Can Europe offer a better alternative? It will be interesting to see who steps forward. And Paul McGinley thought that everything was looking up. Now he's facing an anxious wait on the results of an MRI on a hand injury that could hamper his bid to rack up some Ryder Cup points before Christmas. Two weeks ago, McGinley was riding the crest of a wave at the Vivendi Trophy in Paris, where he rubber-stamped his credentials as the only viable candidate for the 2014 Ryder Cup captaincy by leading Britain and Ireland to an impressive victory over a strong Continental Europe side led by Thomas 'The Diplomat' Bjorn.